Brahms’ sweeping sentiments, Prokofiev honoring Haydn in Modernist terms, and superstar cellist Yo-Yo Ma stretching out over Schumann’s lyricism. Saturday night’s concert at Tanglewood offered grand narratives with a shot of celebrity and a corresponding capacity crowd. Yet the evening revolved around some potent musical details, with guest conductor Christoph von Dohnányi illuminating orchestral nuances and guest soloist Ma cherry-picking the best details for his meaning. From the bustling introduction of Prokofiev’s Symphony No. 1 in D, Dohnányi nurtured a transparent sound and perfectly judged tempi from the Boston Symphony Orchestra. Prokofiev wrote his so-called “Classical” first symphony under the spell of Haydn at St. Petersburg Conservatory, while also noting that if the father of the symphony were alive, “he would retain his way of composing and at the same time absorb something of the new.” Classical sounds such as scurrying figures, sonata form and a foursquare bassoon accompaniment were molded into Prokofiev’s drumming rhythms and gripping twentieth-century harmonies. Dohnányi’s conducting further clarified Prokofiev’s intent. The first movement’s crisp yet balanced “Allegro” illuminated Prokofiev’s rich inner voicings and motor energy, and the second movement’s gentle “Larghetto” unfolded humor into shimmering beauty. The wind soloists of the BSO volleyed brief, colorful solos throughout, receiving a standing ovation when Dohnányi asked them to stand during applause. 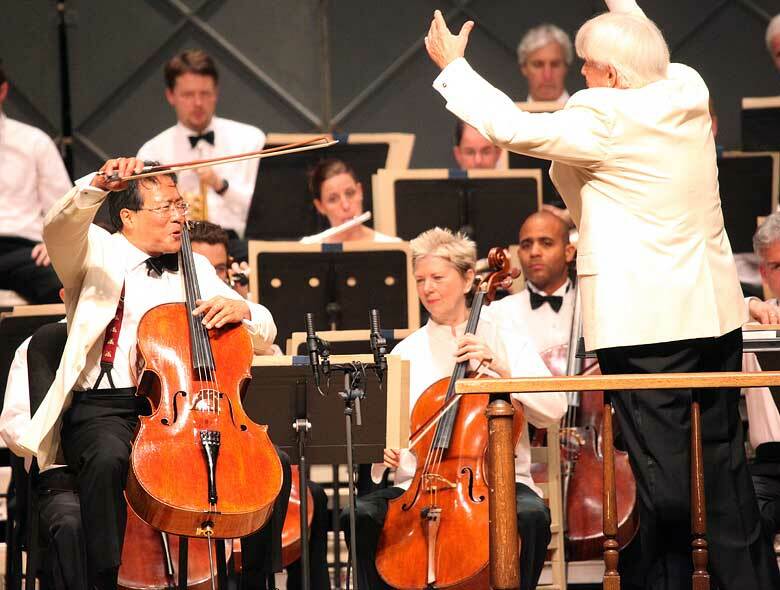 Ovation turned to palpable elation when fan favorite Ma took the stage for Schumann’s Cello Concerto in a minor (before the concert, a gentleman was giddy as he snapped a photo as a souvenir of his first time seeing “Yo-Yo”). Ma’s technique, experience and reputation underscored a wide-ranging interpretation on Saturday night. Ma concentrated on key points of the ruminative first movement, occasionally at the expense of other aspects of the melodic line. While the ensemble occasionally overpowered Ma during some entrances, Dohnányi maintained a sturdy, balanced orchestral foil against the soloist’s dramatic leaning in and out of phrases. The sighing fifths of the second movement (Schumann’s reference to his wife Clara) were by contrast uniformly lush and perfectly enunciated. Ma’s smooth double-stops and vibrato at the end of phrases were deeply personal without turning self-indulgent. For the final movement, Ma returned to the chiaroscuro effects of the first, incisively articulating some runs while making a blur of others. An artist of Ma’s stature has the luxury to unleash cumulative effects rather than microscopic attention to detail. Judging from the overflow crowd at Tanglewood, there are very few artistic sins his fans would not tolerate. In another performer’s hands his approach might be heard as over-indulgent or inconsistent, yet Ma isn’t simply a “big name” who has “paid his dues.” Locking in with BSO and Dohnányi, the performance felt truly spontaneous, right down to Ma’s booming exploration of the accompanied cadenza that closed the concerto. Ma’s smiling face, furrowed brow, stomping feet and excited glances back at Dohnányi and the orchestra merely choreographed the insight and appreciation for this work so evident in his playing. Following Ma’s energy and the intermission, the brooding timpani and throbbing strings of Brahms’ Symphony No. 1 in C Minor sounded that much darker at Dohnányi’s dramatically gradual pace. Brahms is a “big” name of German Romanticism who composed similarly imposing musical structures. Yet Dohnányi’s attention to detail across all parts, from a plaintive oboe solo to all those cavernous double basses and bassoons made Brahms’ vast structures both more lucid and more imposing. Brahms’ rich scoring and packed ideas can overheat and stall under overly luxuriant direction, but Dohnányi’s knack for precise bombast at the end of phrases, and his sensitive ear, relentlessly pushing certain sections while easing others back, made for a majestic, ominous first movement (Dohnányi is also an active stage presence, especially in his pumping motions towards the second violins!). Dohnányi focused a clear tempo underneath Brahms’ massive gestures that ensured ensemble flow rather than simply a succession of “big” forms. The “Andante Sostenuto” began with a slightly more rhapsodic feel and denser textures. Yet through contrapuntal violins, then ethereal strings and winds in call and response, and Malcolm Lowe’s violin singing out in resplendent solo, the second movement’s fragile mood made sense of a time before the thunder and dread of the first. In the third movement, Dohnányi again emphasized a flowing meter under the warmth of the BSO’s wind section. The fourth movement’s “alpine horn” transition to the major key (Brahms’ own reference to Clara Schumann), solemn trombone chorale and broad closing melody brought the symphony to a similarly powerful yet triumphant conclusion. Critics in Brahms’ time experienced difficulty reconciling the power of the outer movements with the delicacy of the middle movements. Rather than trying to answer any supposed contradictions, Dohnányi and the BSO allowed Brahms’ arc to speak for itself, presenting this work of many parts as a richly human experience, rather than a towering complexity. Audience members who attended Saturday night’s concert just to see a Yo-Yo Ma also got to experience a world of details, whether hearing the constituent parts of a “big” composition or how a “big name” chooses to highlight (or shade) his expression. Music, emotions and celebrities this “big” are certainly larger than the sum of their parts, yet hearing how those parts add up makes all the difference. Andrew J. Sammut also writes for Early Music America and All About Jazz, and blogs on a variety of music here. He also plays clarinet and lives in Cambridge.